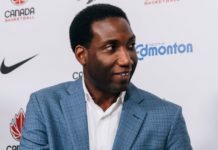 Rowan Barrett Jr. & Abu Kigab lead Canada to 73-67 victory over France, giving Canada its first ever medal opportunity in the FIBA U19 World Cup. Lindell Wigginton, unable to play due to injury (possible concussion), Jordan Henry (Ryerson) started in his place. 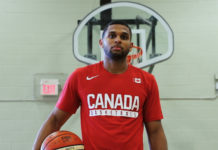 Canada set the tone quickly with Barrett Jr. attacking the rim, followed by Henry’s deep three from 30 feet out, on defense Canada in a 3-2 zone, doubling on the wings making it tough for France to get clean looks or successfully move the ball inside. Both teams shot below their average in the first, but France, who out rebounded Canada, had trouble capitalizing on their second-chance points. Staying tight with the Canadians taking the lead once at 17-15, until Danilo Djuricic hit a three to regain the lead. Kigab playing facilitator today, making beautiful entry passes and all around hustle, like he has proven all tournament and is unmatched had 2 points, 5 rebounds, 3 assists to finish the frame tied with France 15-15. Barrett Jr. led Canada with 8 points on and incredible 75% shooting. 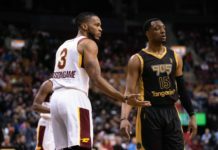 The second quarter continued the low scoring affair as both teams utilized the clock efficiently, patiently waiting for the best moment to strike. Barrett Jr. struck relentlessly when he saw gaps in France’s defense and he attacked in transition with precision. 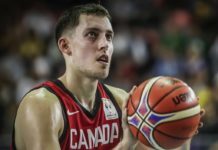 Henry, who was on the mark defensively while running the team in place of the missing Wigginton, drew his second charge, which pushed Canada’s momentum as they finished on a 9-2 run before halftime. Grant Shephard, playing more than previous had an excellent game, setting open floor screens and hustling on plays for easy buckets. France entered this game averaging 14 turnovers and shooting 42% from the field. They had 12 giveaways at half as Canada forced them into making bad decisions, as well as tough shots. The foul count was heavily favoured for the Canadians, as they went to the charity stripe 14 times to France’s 2. Canada led at half 35-25, outscoring France 20-10 in the second behind Barrett Jr.’s 17 points on 6-of-8 shooting from the field. Kigab went into the break with 4 points, 7 rebounds, and 4 assists. During the break, France who have been very disciplined with the ball, had to limit their turnovers and start forcing Canada to cough it up if they were to turn the tide in the second half. Barrett Jr. opened the third quarter, muscling his way through for yet another easy bucket. 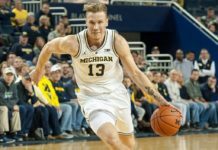 He has an uncanny ability to finish in traffic, in and around multiple defenders. France started to step up the pace down 12, going on a little run hitting a three in back to back possessions, however Noah Kirkwood, hit one of his own to kill any chance of them getting closer. 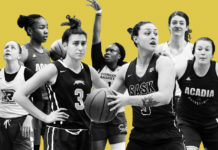 France had to step up their ball pressure, which made Canada set more open floor screens than they normally would, but the fact that there was not one illegal screen called, kept Canada’s momentum afloat. Once again, Kigab found a way to his increase his production as he managed to secure his third straight double-double of the tournament with time still left in the 3rd. Canada maintained their lead going into the fourth and led it 53-44 after three quarters. France, down nine into the final period, had to continue to limit their own mistakes and find other ways to score. 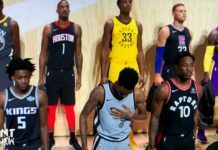 They began to utilize the post to their advantage as their points in the paint came too easily in the second half, cutting the lead as much as they could. Barrett Jr. and Kigab continued their offensive dominance, making sure France never got within one possession on the scoreboard. 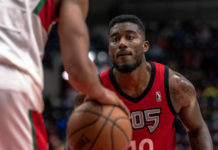 Shephard, who played his best game of the tournament and caught a sweet alley-oop slam from Henry with under four minutes left, showed a lot of hustle on both ends of the floor in his 17 minutes of action. With two minutes left and Canada up ten, and after France’s two possessions, it was 67-60. Then a turnover by Canada, a France bucket in the paint and the Canadian lead was down to five. 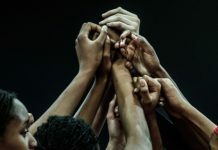 Free throws are a crucial part of the game and can win or lose games and for Canada they definitely helped seal the victory as Shephard and Barrett Jr. went 4-for-4 combined to seal the victory with under a minute left. 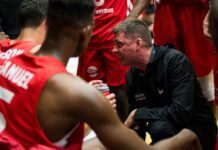 Time simply ran out for the U18 European Champions France, who will not be playing for a potential medal as Canada held on for the 73-67 wins. 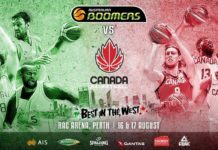 Canada sets date with the United States on Saturday, July 8, 2017 at 2:30pm EST. in the FIBA U19 World Cup Championship semifinals. 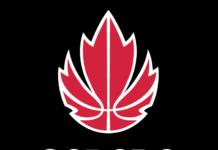 It will not be an easy task, as Canada has never beaten the USA in FIBA competition (only in Pan Am Games – Toronto 2015). Canada has to limit their turnovers, which they did very well in the first half against France, but got worse in the second half. Canada’s defence vs. France was excellent in the first half but against the USA it has to be for a full 40 minutes. 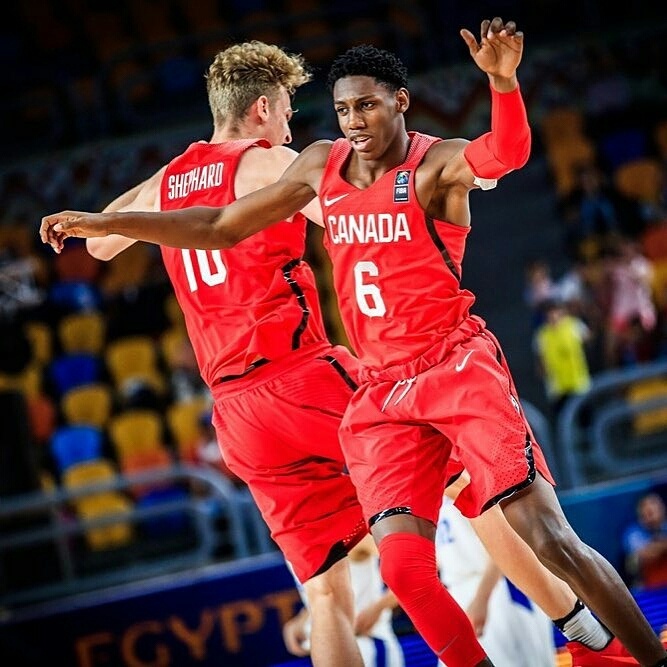 Either way a top-4 finish is the best ever for Canada at the FIBA U19 tournament. 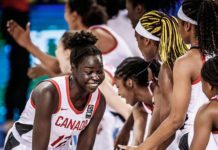 So Canada continues to make history in the sport of basketball and is serving notice to the world.